In recent years, spray foam insulation has been growing in popularity for residential buildings, even though it’s been used in commercial settings for quite some time. An extremely effective, top-of-the-line insulation, spray foam significantly improves any building’s energy efficiency and lasts for a long time. Fortunately for commercial and residential property owners in Kansas City, A+ Insulation is pleased to offer spray foam insulation at a competitive rate. We’re the local team to call when you’re looking for the perfect combination of expert precision and unstoppable customer care. Call us today to learn more about how our insulation company can save you money with high-quality spray on foam insulation! Like blown-in insulation, spray foam insulation expands to fill the space, making it extremely effective for completely filling all of the nooks and crannies of a building. Spray foam is available in two varieties, open cell spray foam insulation and closed cell spray foam insulation (polyurethane). 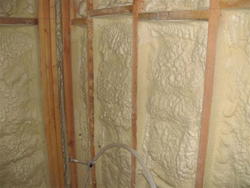 Closed cell spray foam insulation typically has a higher R-value, but open cell is preferred for some applications. If you’re uncertain as to which type of spray foam you should choose for your home’s insulation, don’t fret: The expert spray foam insulation contractors at A+ Insulation can help you determine which type of spray on foam insulation best fits your space, and which R-factor will help you get the greatest energy efficiency and value. While it can be added to existing structures, spray foam insulation is most easily applied to new construction or additions. The installation process is not complicated, but it does require several steps. Spray foam insulation is actually a liquid applied through a nozzle. As it sprays, this liquid foams and expands up to 100 times its volume, spreading out to fill the entire space (usually the space between ceiling joists or wall framing). Once the spray foam is dry, usually after a few minutes, the excess material is trimmed off, leaving the foam insulation flush with the beams. Then you’re ready to add drywall and finish the interior space. It’s as simple as that! If you choose to use spray foam insulation, professional installation from A+ Insulation is a must, especially if you’re insulating large areas such as wall cavities or attic spaces. Other local insulation companies may not have the requisite equipment, skills, and certifications to ensure effective, thorough application. Plus, spray on foam insulation isn’t as cheap as other methods of insulation, so hiring our experienced team of insulation contractors is vital if you don’t want to waste any time or excess foam. We’re extremely efficient insulation contractors, and we’ll take every necessary measure to save you money on this costly material. If you’re interested in learning more about spray foam insulation or you’d like to get started on the installation process, call our insulation company today!